A colossal cache of files leaked to the International Consortium of Investigative Journalists (ICIJ)shed light on the banking giant's clandestine practices between2005 and 2007.During this period, HSBC's Swiss private banking arm controlled roughly $100 billion in assets. The PAC challenged HRMC on Wednesday why it failed to take significant action against former clients of HSBC’s Swiss operation, who were referenced in the leaked documents. It emerged during the hearing, 150 files seen by the tax authority had uncovered grounds for possible criminal prosecutions. But HRMC's director general for enforcement and compliance, Jennie Grainger, confirmed the body had only disclosed three cases to the Crown Prosecution Service (CPS). Criminal proceedings were launched in one of these cases, she revealed. Grainger argued it’s extremely difficult to prosecute individuals for offshore tax evasion. She said in the case of stolen or leaked data, guilt could only be proven using supplementary evidence. Probed on whether ministers were informed in 2010 of the leaked cache of files, Homer said she was unsure of what happened. 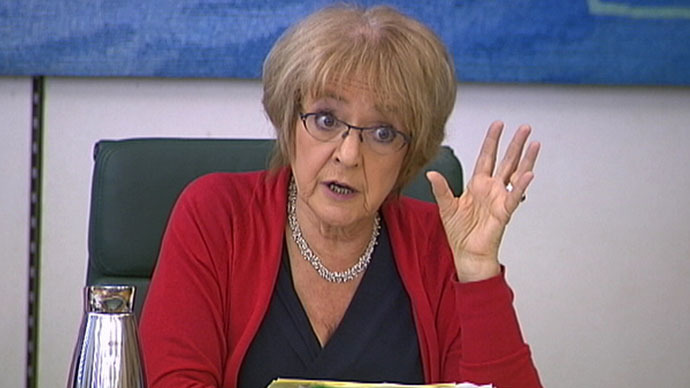 She later conceded concerns regarding HSBC’s practices in Geneva were raised with ministers at the time. Commenting on the HSBC scandal, Joel Benjamin of ethical finance think tank Move Your Money said HSBC had yet again breached international law. He expressed little faith in UK tax and regulatory authorities' capacity to adequately deal with allegations levelled at the scandal-ridden bank. Addressing HRMC chief Lin Homer, Conservative MP Chris Heaton-Harris suggested it’s inconceivable the tax authority failed to approach the Chancellor regarding the leaked HSBC files. Homer said it is widely known covert Swiss bank accounts are used to hide money internationally. But she stressed proving complicity in tax evasion was another matter. The HRMC chief added solid evidence of wrongdoing is a vital prerequisite to criminal proceedings. PAC chair Margaret Hodge asked Homer whether HSBC’s 170 accounts in Jersey was evidence of endemic HSBC tax avoidance and evasion. Homer failed to answer the question directly, but said in cases where HRMC uncovers financial irregularities at a bank, it passes the information on to the relevant authorities. Following Wednesday's hearing, the accounts committee is set to decide whether to call one of Homer’s influential predecessors, Dave Harnett, to give evidence. Harnett was HMRC’s chief executive when it dealt with leaked evidence implicating HSBC in tax evasion activities. He worked at the tax authority between 1976 and 2012. Following his departure from the government tax authority, he was hired by HSBC to head its newly formed in-house financial crime committee. As part of the role, he was responsible for reporting to the bank's board. Harnett goes HMRC to HSBC. Green goes HSBC to Govt. Only 1 HSBC tax evader is prosecuted in UK? All seems very cosy at the top, doesn't it? HSBC founded the financial crime committee after it was forced to pay American authorities £1.2 billion in the wake of allegations it helped Mexican drug cartels launder dirty money. Move Your Money's Joel Benjamin said Harnett’s transition from government tax chief to head of HSBC’s financial crime committee was a damning indictment of a revolving door culture that blackens British banking. “The move highlights the rotten core of the UK’s financial services sector, and the all too cozy links between the government, the big four banks and accountancy firms,” he told RT. As controversy over HSBC’s role in facilitating tax evasion gathers momentum, the bank’s former chairman and chief executive, Lord Green of Hurstpierpoint, has come under increasing pressure to disclose what he knows. He has so far remained silent on the issue. The Public Accounts Committee is expected to hear evidence from Green in the near future. The Treasury’s Financial Secretary, David Gauke, claimed on Monday that no evidence indicating Green was “involved or complicit with tax evasion activities” has materialised. But the Labour party is calling on Prime Minister David Cameron to make an official statement on the ex-HSBC chairman’s role at the bank, and his subsequent appointment as a minister in 2011. Shadow Chancellor Ed Balls said the government appears confused over the leaked HSBC documents. Downing Street recently claimed no records exist of a government minister being informed HSBC had facilitated wrong doing. But the Treasury later conceded the government became aware of allegations against HSBC in May 2010. Benjamin says he is doubtful the PAC's inquiries will breed tangible reform. “Our politicians can't be trusted to clean up HSBC, when tainted individuals like Lord Green are personally invited by David Cameron into the heart of the UK government,” he told RT.